If you've always dreamed of being able to bring Marvel's heroes and villains together, this game will allow you to do just that. Marvel Tournament of Champions invites you to create a team of heroes by drawing from a large list of characters all from the Marvel universe. Each character has its own characteristics and can complement the strengths of another. It is up to you to try to find the best possible combinations to have a balanced team. 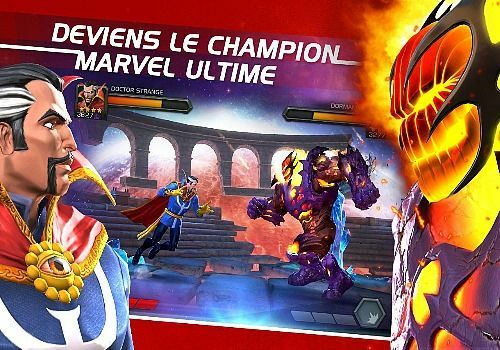 Available as a free download, Marvel Tournament of Champions offers integrated purchases for those who want to get bonuses faster. Puzzle Fighter is an Android game that allows you to find well-known heroes from Capcom's licenses in a puzzle game where you will have to destroy gems to win the fights. Bandai Namco has announced the release of a new mobile application Dragon Ball. Still secret, the Dragon Ball application promises to delight fans of the anime. Like most successful Japanese anime series, the My Hero Academia series has also been translated into mobile games.